Take a 5.5 hours round-trip, down to Plantation Country and explore one of three plantations. Whitney Museum Plantation: During the 90-minute walking tour, visitors will gain a unique perspective on the lives of the enslaved people on a Louisiana sugar plantation, learning their stories through the real oral histories recorded by the Federal Writers Project during the Depression. Laura Creole Plantation: The Best History Tour in the United States. Tour includes The Maison Principale (Big House), Oak Alley Antebellum Plantation: Explore the most photographed plantation in Louisiana, this home was built in 1839 and was originally name Bon Séjour. The quarter mile avenue of 28 giant, live oaks leading up to the house, they dubbed it Oak Alley. Daily pickup at 8:00am from downtown hotels. 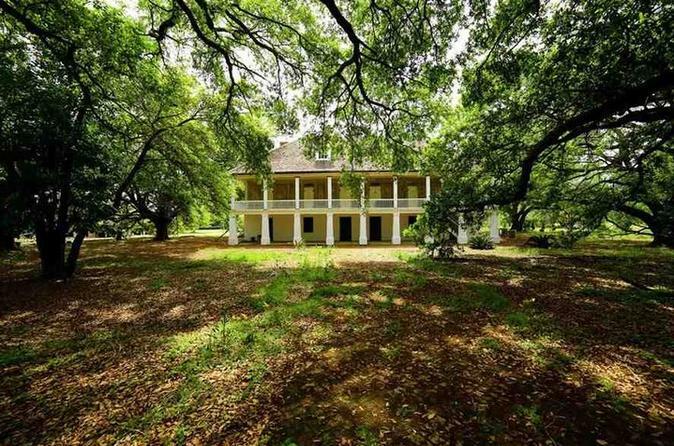 Explore one of three historic plantations (Laura, Oak Alley or Whitney Plantation). Take a guided narrative tour down to Plantation Country in a 14 passengers bus. Laura tour includes The Maison Principale (Big House), The French Jardin, The Plantation Kitchen Garden, The Banana Grove, and the original 1840s Slave Cabins where The Legendary Tales of Compair Lapin (known in English as Br’er Rabbit) were first recorded. Take time to browse through local arts, crafts and souvenirs in the historic Laura Plantation gift shop. Also don’t forget to visit the new museum exhibit where it displays the daily lives, free & enslaved, on the sugar plantation. That’s why Laura Creole Plantation was awarded the title of top travel attraction by The Louisiana of Tourism. Oak Alley Plantation includes gracious interiors that echo the romance of another era, where gleaming hardwood floors and shimmering chandeliers reflect both streams of sunlight, and the venerable history of this magnificent home.The Slavery at Oak Alley exhibit it shares the story of those who were enslaved on this sugar plantation from approximately 1835 to the end of the Civil War. It also shares the daily life of these slaves, including topics such as healthcare, punishment and life after Emancipation. The Confederate Commanding Officer’s Tent exhibit. The Sugar Cane Theater, it tells the story of sugar’s impact on the people of Oak Alley, through video and exhibit. Black Smith Shop House, one of the few remaining 1890s era forges of its type in Louisiana. Whitney Plantation (CLOSE ON TUESDAYS) is on the National Register of Historic Places, the site includes the last surviving example of a true French Creole Barn, what is believed to be the oldest detached kitchen in Louisiana, and the Big House, considered the earliest and best preserved raised Creole cottage in Louisiana, all built by slaves. With the original structures nestled in a working sugar cane field, visitors are sure to marvel at the authentic representation presented at Whitney. Through these restored buildings, museum exhibits, memorial artwork and thousands of first-person slave narratives, Whitney Plantation gives a voice and respect to the slaves, who lived, worked, and died here.